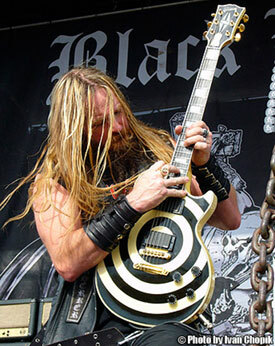 Lifer — Zakk Wylde’s Undaunted Guitar Odyssey Continues in the Catacombs of the Black Vatican. Take, for example, the militaristic bull’s-eye logo Wylde is so vividly associated with. It’s all over his signature Gibson guitars, Marshall heads, and Dunlop/MXR pedals—but while it may invite combat-related puns when describing his aggressive guitar parts (like “machine gun riffs,” “explosive tones,” etc. ), the logo Wylde originally envisioned had nothing to do with artillery or targets. He is known to study the playing of jazz genius Joe Pass and the books of chord chemist Ted Greene. He is not afraid to venture out of the world of metal, where he is king, as he proved by being a featured performer on this year’s Experience Hendrix tour. He is, rock and roll rogue exterior aside, a family man. He and his wife, Barbaranne, have four children whose ages, amazingly, span 18 months to 21 years. JUDE GOLD: What is the Black Vatican? ZAKK WYLDE: It’s my home studio. It used to be the guesthouse, but we hired Zack Fagan and his company, Under the Wire, to convert it into a place where we could track and mix. Zack designed Ozzy’s home studio, and he does the job right. We basically gutted the place, which used to be a mobile home—ripped out the floors, the bathroom, and the shower—and remodeled. One bedroom became the drum room, and the master bedroom became the lounge. There is also a piano room, and another bedroom is now the amp room. The console and Pro Tools rig are in the middle of it all. It came out great. Well, I can get a great clean sound from my 800s by turning off my overdrive pedal and backing off the guitar’s volume—that results in a tone that kind of sounds like the clean part on ZZ Top’s “La Grange.” But a lot of the chimey stuff you hear on new songs like “Scars” and “Angel of Mercy,” and in the breakdown on “I’ve Gone Away” was done with a Roland Jazz/Chorus 120. For those parts, I used either the tobacco sunburst ’57 Les Paul Junior Ozzy gave me when we were recording No Rest for the Wicked or the ’58 double-cutaway Junior Michael Beinhorn got me when we were doing Ozzmosis. The P-90 pickups in those guitars sound great through the Roland. It’s a bit brighter than, say, my Grail, which, like most Les Paul Customs, has an ebony fretboard. It’s a bit honkier. I remember Gibson had put out a Les Paul in 1978 or so that had a maple fretboard and a clear maple neck and looked cool. That was the idea behind the new guitar. I used the Vertigo for pretty much all the distorted rhythm guitar tracks and many of the solos on Black Vatican. For the solos on “Angel of Mercy” and “Scars,” though, I used Blue Balls, which is what I call one of my Pelham Blue Les Paul Customs. And for the solo on “Damn the Flood,” I used the tobacco sunburst Johnny Winter-style Firebird that I got after we finished Ozzmosis. The single-coils on that thing sound great. Either way, the drinking just was what it was—that was me back then. How would the Beatles or Hendrix have sounded if they came out in 1955 and never became engrossed in the ’60s culture of acid and weed and the hippie movement? Different, that’s for sure. Jimi was, at his core, a blues player—an amazing blues player. When you stuck all that psychedelia on top of his sound, well, that’s what made that soup. Speaking of Jimi, you were featured on this year’s Experience Hendrix tour. That seems like a branching out of sorts for you. It’s definitely cool to have had this opportunity to show people a different side of what I do. I was doing songs like “I Don’t Live Today,” “Purple Haze,” and, with Jonny Lang, “All Along the Watchtower.” One night we all closed with “Red House,” led by Billy Cox. And for “Are You Experienced,” I’d be on piano, accompanying Eric Johnson. The after-show hang was unbeatable. You’re sitting there trading war stories with Kenny Wayne Shepherd, Eric Gales, Rich Robinson, Dweezil Zappa, and Chris Layton from Double Trouble, and everyone’s laughing their balls off. The only reason I put effects loops on my signature heads is for all the guitar players out there who do like to use them. One reason the chorus works straight in for me is because my basic amp tone is not too distorted—it’s delivering an AC/DC-style “Back in Black” level of overdrive. I can hit it with the guitar full up and it doesn’t feed back. For solos or heavy rhythm parts—like if I’m doing “Miracle Man”—I kick in the overdrive. That pedal pushes things over the top and adds a ton of sustain. If I’m recording and want a wide spread, though, I don’t usually use chorus. I just double the parts, which results in a natural chorusing effect. Great. He really throws down. Our first concert together was the big Schecter event at the NAMM show in January, and then we did the acoustic book tour together on the West Coast, East Coast, and in Canada—which I call the Polar Bear Run, because temperatures were hysterically cold, often 40 or 60 below with wind chill factor. It was just me and Dario, and when I’d switch to piano, he’d be shredding on the guitar solos. No, he actually goes out of a complete copycat version of my rig—same Marshall heads, same Dunlop pedals. There’s no sense in lugging in a ton of outside sh*t when I have everything we need right here—the same gear we used on the album, pretty much. He does use different guitars than me, though—LAG guitars. He really digs those and has been playing them for years. I keep the top five strings normal, so that when I’m soloing on those strings, all the scale patterns are the same as when I learned them. If all six strings in are in standard, I’ll be using one of my signature Dunlop .010-.052 sets. But the lower you drop a string in pitch, the thicker the string gauge you’ll need to keep the tension up so that the string doesn’t start flopping around and you can’t tell what you’re playing. The lowest I’ll go is dropped-B, and for that I like to have at least a .060 on there—maybe even a .070—to keep the string tight. I actually didn’t use any dropped-B on the new record, but a good example of it would be “Crazy Horse,” the first song on our last studio album, Order of the Black. EXTRA: An interview with Zakk’s new right-hand man, Dario.